Explosive pre-workout formula helps deliver ultimate performance in gym. Supplies tyrosine and citrulline to improve stamina, focus and energy. Enriched with arginine to support increase in blood flow to the muscles. Provides caffeine to stimulate nervous system and delay perception of fatigue. 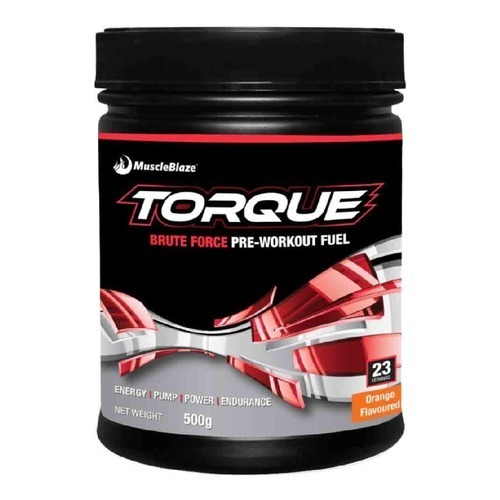 Ramp up your workout performance with MuscleBlaze Torque Brute Force Pre-Workout Fuel. Unlike other pre-workout mixes, this explosive pre-workout formula is packed with right nutrients, which gives you many benefits in a single supplement. It boosts your energy level, enhances endurance, increases blood circulation, pumps up your muscles and helps you work out for long hours at the gym. MuscleBlaze Torque Brute Force Pre-Workout Fuel increases your focus to help you achieve high through the training sessions. Two game-changing ingredients present in this all-new MuscleBlaze pre-workout mix are bioprene and red spinach. Addition of red spinach amplifies your endurance and makes you work out hard, increasing the much-desired result. Bioprene allows an easy absorption of the nutrients in your body. The presence of beta-alanine delays muscle fatigue and caffeine improves mental alertness and muscular strength. The supplement also contains tyrosine, which, along with caffeine, enhances your mental focus and alertness, and drives you to achieve more at the gym. Containing arginine AKG, this pre-workout powder from MuscleBlaze improves the supply of blood to the muscles and helps in pumping up of muscles. The science-backed nutrients present in this supplement supercharge your workout sessions to increase your high intensity performance at the gym. So, go get a pack of MuscleBlaze Torque Brute Force Pre-Workout Fuel and experience the change in you. PRAKRITI INTERNATIONAL, an ISO 9001: 2015 Certified Company is one of leading Fitness Company in Eastern India providing all kinds of Exercise & Fitness Equipment, Outdoor Gym Equipment, Sports Nutrition, Sporting Goods, Sports & Fitness Accessories, etc. We do whole selling & Reatiling of world class Sports & Fitness Equipment under the banner "CLUBFIT"and We provide international standard Physical Training at our Health Club / Gym under the banner "STEELFLEX FITNESS STUDIO". 2. 60/1, Jessore Road North, Near Seth Pukur, Barasat, Kolkata Gym / Health Club: Steelflex Fitness Studio, Barasat, Kolkata. OUTDOOR GYM: Air Walker, Horse Rider, Sky Stepper, Exercise Cycle, Seated Rower, Sit-up Benches, Twister, Chest Press Leg Press, etc. SERVICES: Installation of Gym, Installation of Outdoor Gym Equipment, Repair & Service of Treadmills, Elliptical Trainers, Massage Chairs & all kinds of Fitness / Gym Equipment.